If you’ve just picked up the trumpet, you’ll need one of the best trumpets to see you through the learning period and the next few years of playing. Luckily, we’ve assembled an awesome list of trumpet reviews to help you choose something that works well for you. We’ve included everything from what's great for beginners to some of the best professional trumpet brands so don’t worry if you’re a seasoned player. Accessories: If you’re just getting started a trumpet that comes with accessories could be crucial. This makes it easy to get started right away and experiment with buying accessories of your own. Color: The color can matter a lot to trumpet players in marching bands or people who just want to show off their style. Choosing one with a color that works for you can be easy with our guide. Finish: The finish can help you determine what kind of player the trumpet is suitable for. Things like plastic are best for absolute beginners and students who are prone to dropping their instruments. Level: The level is important when buying a trumpet. Some people need something that works for absolute beginners, while some are on the hunt for a more intermediate trumpet. Key: Many of the trumpets on our list are in the key of Bb, making them perfect for use in any school band. This is the key many trumpets are made in. Warranty: The warranty allows you to buy with confidence knowing that the manufacturer has some faith in the product you are buying and is willing to back that up. Now that you know what to look for, let’s get right to our Trumpet buying guide. This guide will help you choose the best trumpet for you. Our top and budget picks are great places to start for anyone who wants to make sure the product they’re getting is the best of the best. We’ve also included eight other trumpets for you to look at and decide between. Happy playing! Our top pick is hands down the best student trumpet out there. This trumpet is a great choice for any beginner. It is tuned in the key of Bb, so you’ll be able to play along easily with the rest of the band. This trumpet even comes with a robust contoured carrying case. This case makes it easy for you to feel secure taking it anywhere. This allows you to easily take your trumpet on the subway or even on the bus without worrying about it getting banged around. The beautiful yellow brass body construction gives it durability and a great sound. It is finished in a gold lacquer, so it’ll be the star of every show. This trumpet comes with some great accessories included. The accessories are- a carrying case, some valve oil, a pair of gloves, a cleaning cloth, and a mouthpiece. This ensures you’ll be ready to play as soon as you get your trumpet. Our budget pick comes from one of the best trumpet brands for students. Mendini makes great quality trumpets at a fraction of the price, so it’s ok if you don’t keep up with the instrument. The best thing about this cool trumpet? It comes in seven different colors so you can really express yourself with your instrument. The colors available are- black, blue, gold, purple, red, silver, and teal. This makes it easy to find a color that works for you. This lacquered trumpet plays in the key of Bb, so you can keep up with the band. This trumpet comes complete with smooth action pipes and valves that make it easy to play well. This trumpet comes with a case, a bottle of valve oil, a soft polishing cloth, and a pair of white gloves. This makes it easy to take care of your trumpet for years to come. This is a great pick for any beginning trumpet players. This is a great choice for anyone who needs one of the best professional trumpet on the market. This trumpet has a professional bell and bore size for ideal sound, resonance, and intonation. This makes it easy to sound amazing while you're playing this trumpet, giving you ideal quality and performance. The clear lacquer finish and rose brass leadpipe give this instrument a full and clear tone. This makes this an ideal pick for anyone concerned about sound quality when purchasing a trumpet. It comes with a braced tuning slide to help you maintain alignment. This makes it easy to sound right every time. It also includes stainless steel valves for consistent performance. This also helps you to protect your trumpet against corrosion. This trumpet also comes with a plush lined hard case, some Yamaha valve oil, and a standard size 7C mouthpiece. 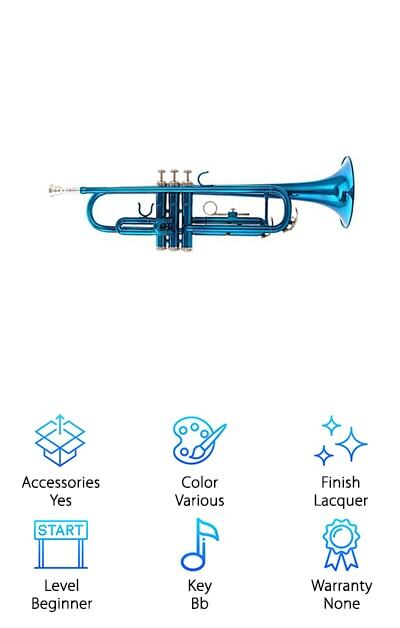 This trumpet also comes with a 2-year warranty, so you can purchase confidently. This is another trumpet with lots of flair. This is a great choice for anyone who needs to match their instrument to their team colors or style. 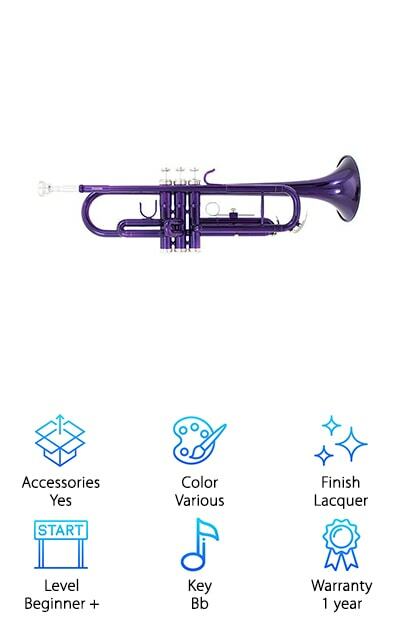 This trumpet comes in black, blue, gold, purple, red, double brace, white, grey, and silver. This makes this trumpet a perfect choice for anyone who wants to show off a bit of style while they play. This instrument is made of solid brass and plays in the key of Bb. It comes with a silver plated 7C mouthpiece that makes it easy for anyone to play this trumpet well. This instrument also comes with a hard-shell case, a pair of gloves, and a cleaning rug. This makes it easy to maintain your trumpet for a long time. This trumpet is approved by teachers and would make a great trumpet for any beginner or intermediate student. This is a great choice for anyone looking for style on a budget. This classic trumpet is a great choice for anyone looking for a solid trumpet that won’t disappoint. This trumpet comes with a molded case, a polishing cloth, some valve oil, a case shoulder strap, and pair of white gloves. These things help you care for and carry your trumpet with you wherever you go. It also comes with a standard 7C mouthpiece for optimum playability. This makes it easy for anyone to pick up this trumpet and begin to learn. It has a thumb hook and a slide ring to allow you to easily grip the trumpet, so you’ll be focused on playing not on holding your trumpet. This model also comes in a few different colors- gold, nickel, blue, and purple. This makes it a perfect style match for anyone. It comes with a lifetime warranty that allows you to buy with confidence. This is a great trumpet for any beginner player. This trumpet is perfect for the beginners or for anyone with an accident-prone child. 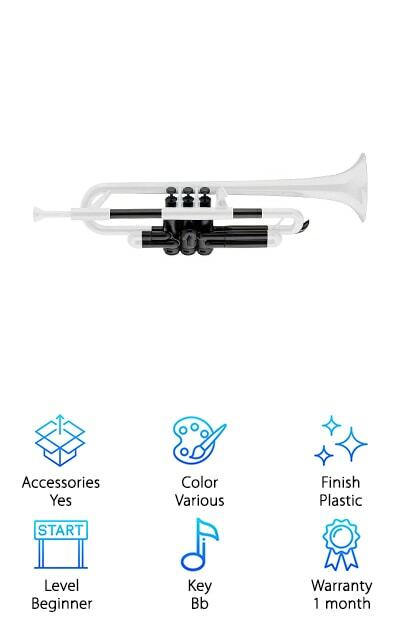 This plastic trumpet is easy to carry because it is lightweight. This also makes it more durable than some more expensive trumpets. This trumpet is pitched in Bb, making it the perfect time to go along with the band. This trumpet has a 4.75-inch bell that gives you optimal sound. The unique system is made entirely of plastic, so you’ll never have to worry about hurting it by dropping it. It has a one-piece patented lead pipe to give it a more authentic sound. 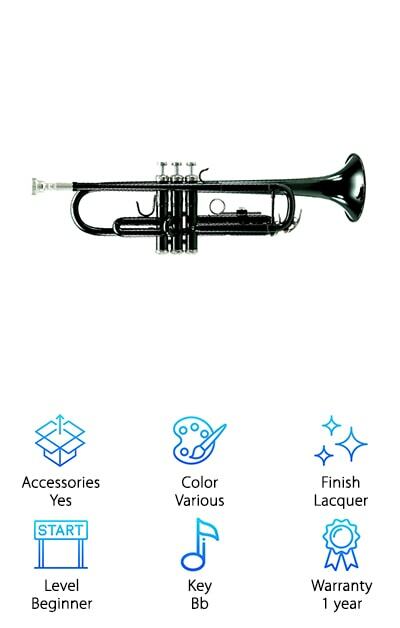 This trumpet comes with a 5C and 7C mouthpiece and a bag to carry everything around in. This model also comes in multiple colors- orange, black, green, purple, white, and yellow. This makes it a perfect accessory to get your child excited about learning trumpet. This is a great choice for any beginner trumpet player. 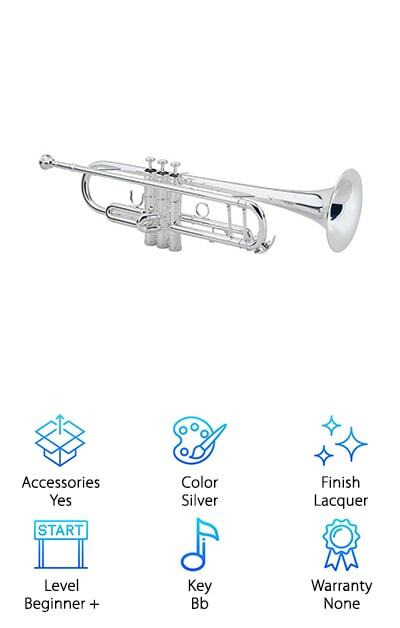 This trumpet is a great choice for any beginning student. This D'Luca trumpet meets school standards for providing great intonation, comfort, and mechanical reliability. This makes it a great choice for anyone who needs s a trumpet to last all through their playing days. It comes in multiple colored lacquer finishes- black, purple, gold, green, nickel, blue, red, silver, and white. It even has white mother of pearl inlays on the keys for a truly professional feel. This trumpet kit includes some accessories to help you on your way to playing the trumpet like a pro. These include- a professional case complete with a D’Luca patented back strap design, a silver plated 7C mouthpiece, a pair of gloves, and a D’Luca cleaning kit with a use & care guide. This will help you keep your trumpet in tip-top shape for years to come. This trumpet even comes with a year-long warranty to help you buy with confidence. This is a great choice for anyone on the hunt for their child's first musical instrument. 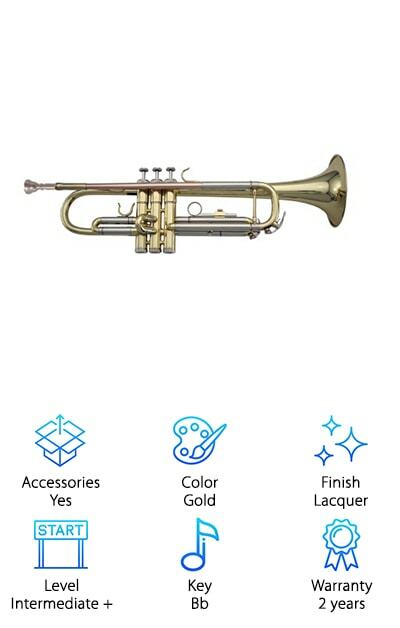 This trumpet has four notes to allow your child to make funky tunes all day long. This trumpet is a great toy for anyone who wants their child to understand the value of music from a young age. This is a great choice for people who are just beginning to pick up the trumpet. This trumpet provides a fun and educational way to boost your child's confidence. 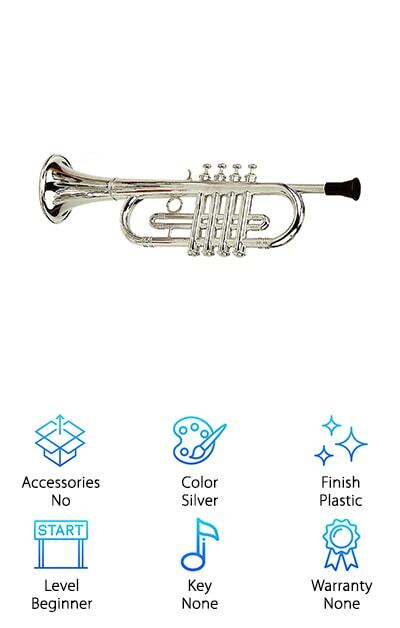 This trumpet is a great pick for anyone who wants to play around with the trumpet and show their child the magic of music without a complicated or difficult to use instrument. This trumpet is plastic and heavy duty so you can be confident your child will not break it or damage it. This makes it a great choice for young children. This is a perfect trumpet for beginners. If you’ve been waiting for our Allora trumpet review here it is! 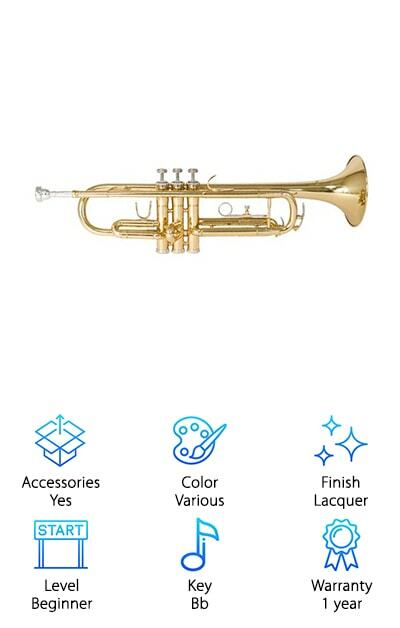 This trumpet is a great choice for anyone on the hunt for something classic and useful. Allora is one of the best trumpet brands out there, making this a perfect choice for anyone who wants something that's well recommended. This trumpet offers professional-level quality at an affordable price, making it great for anyone on a budget. This trumpet is st in the key of Bb, making it fit right in with the rest of the band. It has a medium-large tapered bell that gives it incredible sound. The 1st-valve thumb saddle and 3rd-valve finger ring make it easy for you to grip the trumpet for a long time, making playing a breeze. This trumpet comes with a case and a mouthpiece, so you can start playing as soon as you receive it. It comes in a sleek silver lacquered finish. We’ve saved the best intermediate trumpet for last. 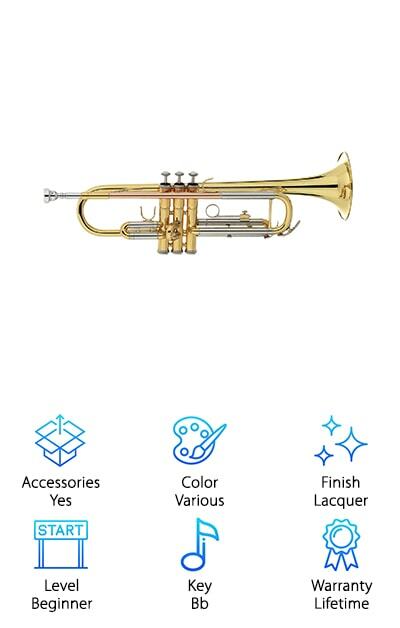 This trumpet comes with everything you need to get started. Ir comes with a case, a cleaning cloth, a pair of gloves and some valve oil. This makes it easy to get started as soon as you open up your trumpet. This trumpet is tuned to Bb, making it ideal for playing along with any band. This instrument also comes with a one year warranty against manufacturer's defects. 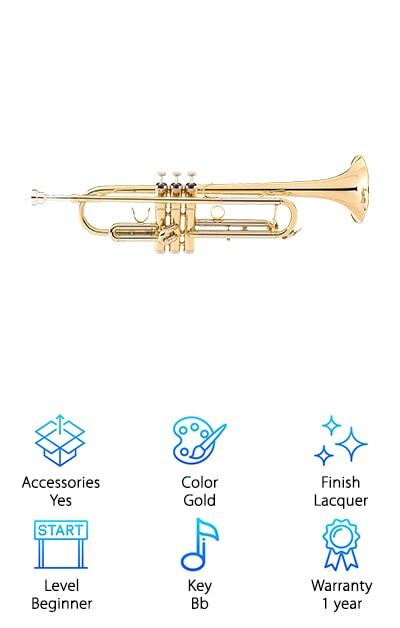 This allows you to buy with confidence, knowing that you’re getting a great trumpet. This instrument provides exceptional sounds and is sure to please. It comes in multiple colors. The colors available are- black, blue, gold, green, nickel, purple, red, silver, and black nickel. This makes it easy to pick a style that suits your personality or your team. This is a perfect trumpet for anyone from beginner to intermediate players. This is a great first trumpet for many players.